Start Button: Pauses the game. Brings up the Pause menu, were you can view the time, date, your own character's health status, items and tools, etc. Look: Allows you to take a closer look at something, usually around people's houses.
? : When you're holding an item and this appears over the A button, you can see the description for that item. Talk: When standing near a person or animal, you can talk to him/her. Use: When holding a tool, you can use it. If you're holding the tool and in a place where you cannot use it (say, you're standing in the pasture with the watering can), then a ? will appear instead of the word "Use." Door: As it suggests, you can open a door in frontof you when this appears. If the door is locked or if the people inside are sleeping, then a message will pop up on the screen. Ride: When standing next to your horse, pressing A will allow you to mount him. X Button: Used to access your rucksack. When your child is a toddler and you pick him up after he's asked you to, then the X button can also be used to pat him on the back. 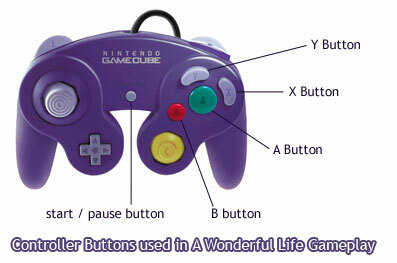 Y Button: Just like the A button, a little note will appear over the Y button in the button menu when you can use it. However, the Y button is not used nearly as often as the A button. Pick up child: This only works when your child is a toddler. When standing next to him, you can pick him up. If you picked him up without him asking to be held, then this button would also be used to put him back down. Heart: When standing next to an animal or holding your child, a heart may appear here. If you press it, you'll hug the animal or snuggle your child. They really like that!